Geepas presents you with this simple, yet handy daily use appliance, An Electric Cordless Kettle. Every Geepas product is inspired by you. AC – 220 To 240V; 50/60Hz; 1850 – 2200W. 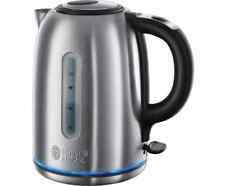 CORDLESS KETTLE, 1.5L CAPACITY - The kettle is cordless. 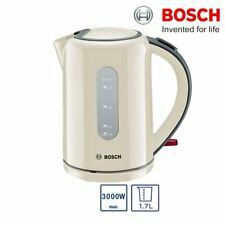 Bosch Village Collection Cream Kettle (TWK76075GB). Manufacturer Code: TWK76075GB. 1.7 Litre capacity. 1.7 Litre Capacity. Jug style kettle. Bosch Village Collection Cream Kettle. Type Jug Kettle. A classic from Bosch. 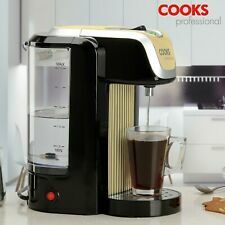 Combining over half a centurys worth of expertise with updated modernized features, the Legacy Kettle boils hot water in a fast and stylish manner, injecting a touch of personality to any work surface.Featuring a rapid boiling zone of 1, 2 and 3 cup options, the kettle can boil hot water in as fast as 45 seconds. Lift off lid, non-slip feet and cord storage. 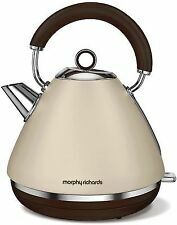 The Morphy Richards 102101 Accents Special Edition Kettle not only looks beautiful but also gives you everything you need, the 6 cup, 1.5 litre capacity ensures that the whole family can enjoy a delicious cup of coffee before their busy schedules and the rapid boil, 3000W power ensures that the water is boiled quickly and efficiently. Judge Induction Stove Top Kettle Cream Ivory for Aga Rayburn. Condition is Used. Looks like new Dispatched with Royal Mail 2nd Class. Whistling Delux Kettle. 2.5 Litre whistling kettle. Suitable for gas and electric hob styles. Whistling spout. RETRO LOOK. Stainless steel. Quality stainless steel construction. Stainless Steel. This is my Alessi Cream 1.5 Litre Cordless Electric kettle which I have just replaced owing to a new kitchen. Typhoon living stove top kettle cream, also available in blue, cream, and grey. High quality stainless steel body. Heat resistant exterior coating. Quick flip cap that whistles once water has boiled. Haden Cotswold Putty Kettle. The Cotswold range is available as a kettle, toaster & microwave in three charming colours. Delightfully elegant the Cotswold range will add a dash of colour to your kitchen. Rapid Boil Yes. Colour Natural. Cord Storage Yes. Product Type Electric Kettles. Water Level Indicator Yes. We go above and beyond to ensure you receive the best level of service. Model Number GPK401H. Whistling open by an automatic button on the handle. The kettle is made of 18/10 stainless steel. The steel from which the kettle was made has been used for decades for the production of cutlery, kitchen utensils and various kitchen accessories all over the world. UK KETTLE BOUGHT FROM MY LOCAL TESCO. THE KETTLE NOT THE WIFE. NEVER BEEN EVEN TAKEN OUT OF THE BOX. KITCHENAID Artisan 5KEK1522BAC Traditional Kettle - Almond Cream. Induction ready, suitable for ALL hob types. Dishwasher and oven safe upto 180 Degrees Celsius. Teflon Classic Non-Stick cooking surfaces. Easy grip, comfortable phenolic LHT handles. New whistling kettle with phenolic handle and whistling spout. High quality stainless steel kettle with 2.5 Ltr capacity approx. Distance between handle and pot 14cm approx. Stove Top Kettle. Generous 2.5 litre capacity - perfect for when making a large pot of tea for the whole family. Stainless steel body with heat-resistant exterior that protects hands. Quick-flip spout cap whistles once the water has boiled. Rapid Boil: Boil one cup in 45 seconds based on boiling 250ml water. Pull to open hinged lid. Rapid boil Zone with 1,2,3 cup markings-ideal for faster boiling options. Polished stainless steel. Perfect Pour gives a precise single stream when pouring. Severin WK3469 Jug Kettle 1 Ltr 2200W. Severin WK3469 stainlsss steel 1 litre 2200W kettle with extra large easy to fill spout, removable washable filter and 360 degree cordless base. Output: 2200W. Compact, powerful electric kettle, high-quality stainless-steel design. 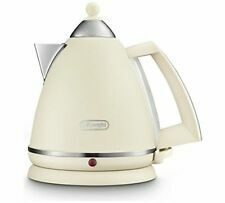 Bosch Village Collection Cream Kettle (TWK76075GB). Manufacturer Code: TWK76075GB. 1.7 Litre capacity. 360 degree base for left and right handed use.